CARIBOU - Current and potential Small Business Administration (SBA) Microloan borrowers at Northern Maine Development Commission (NMDC) have access to a wide range of services to help their business succeed thanks to nearly $78,000 in technical assistance funds awarded to the Business Finance Division from the SBA. The SBA Microloan program offers small business loans up to $50,000 for a maximum of six years. 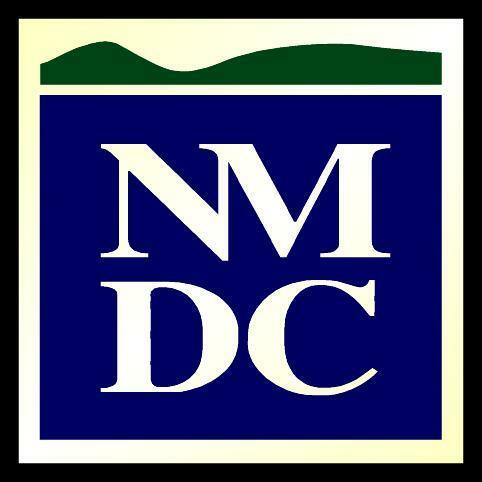 The current rate of NMDC's microloans is fixed at 5 percent. These funds are for working capital, inventory, supplies, furniture, fixtures, machinery and equipment. The recently awarded technical assistance funds are used to assist both pre and post loan clients. "SBA feels that a strong technical assistance program will help ensure the success of microloan borrowers," said Duane Walton, Director of Business Finance. Technical assistance may be offered in the form of individual counseling, classroom style training or peer group training. It includes assistance in marketing, management, business counseling and training. Counseling can include giving advice, guidance or instruction specifically tailored to an individual or a group of individuals associated with a single business. Participating in the APP Education to Industry Summit internship panel are, from left, Elizabeth Whittaker, MMG Insurance; Lucas Towle, TAMC; Christian Sleeper, Cary Medical Center; and Riley Parady, Katahdin Trust Company. Moderating the panel was LEAD Executive Director Ryan Pelletier. PRESQUE ISLE - More than 60 educators, business people, economic development officials and workforce specialists gathered at the University of Maine at Presque Isle Campus Center Thursday, Aug. 7 to discuss outmigration and how to better connect students with emerging jobs. Aroostook Partnership for Progress President and CEO Bob Dorsey said the first summit last summer brought awareness about the growing need for skilled workers in Aroostook, especially in the 18- to 44-year-old demographic, and the second summit expanded on ongoing efforts and highlight best practices. "The summit is part of a larger APP "Education to Industry" initiative, which looks to promote more job shadowing and/or internships to show middle, high school and college students there are good jobs available in the region with the right skills," said Dorsey. The first hour of the morning long event highlighted some of the successes of the past year. 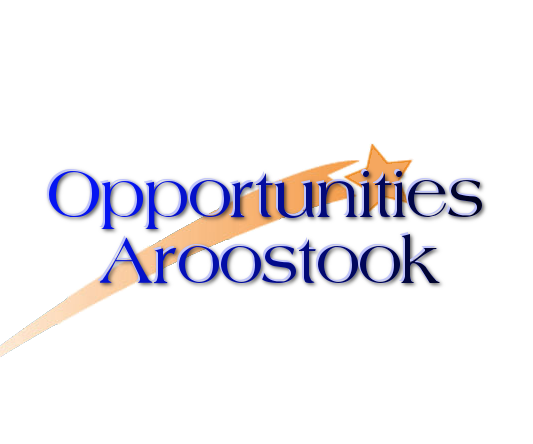 April Flagg, executive director of the Aroostook Aspirations Initiative briefed the attendees on how the Initiative has evolved over the past 12 months and stressed the need to bond youngsters to the region in hopes of retaining them after graduation. Mark Wilcox of the Junior Achievement (JA) program in Aroostook said JA reached 846 students in the region, which marked substantial growth from the previous year. Wilcox added that the program has been expanded to the St. John Valley and Houlton areas and continues to grow. SAD #27 Superintendent Tim Doak shared some best practices from his district. "Everything we do in our schools should be to meet the demands of Maine's workforce," he said. "The most important assets in our schools are the students." Doak's speech segued nicely into a keynote address from former school superintendent and Maine Department of Education official Don Siviski. Currently an educational consultant, Siviski is also an advocate for reforms to the educational system, most notably the adoption of proficiency-based standards. "We need learner centric schools," said Siviski. "You have to stop doing what doesn't work to pay for what does work." Siviski said the traditional model of education is changing to allow for the different ways people learn and to create more analytical thinkers and not students who can just regurgitate facts. Two elements from last year's summit remained. An employer panel on internships and job recruitment, which featured Tim Freeman from Daigle Oil Company, Barb Turner of The Aroostook Medical Center and Bonnie Foster of Katahdin Trust Company. The same theme was echoed by the panel participants. "We feel internships are very important for the future of our organization," she said. Katahdin Trust Company is looking at 15 percent of its workforce being of retirement age in the next five years and 30 percent in the next decade. "We got involved in internships and job shadowing because of need," said Freeman. After the employer panel, it was a chance for the interns, Lucas Towle, Elizabeth Whittaker, Riley Parady and Christian Sleeper, to speak. 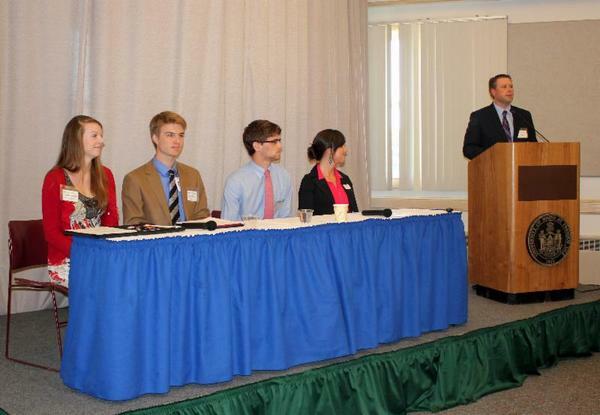 Just like last year, the majority of the interns were not aware of the opportunities in Aroostook County. "Without this internship I wouldn't have been aware of this career path at Katahdin Trust," said Parady. "We need to do a better job of publicizing what is available. Sleeper, an intern at Cary Medical Center, had advice for other young adults curious as to what the region has to offer. "Students need to take initiative," he said. "Send out emails, network and work towards what you want. Towle is interning at TAMC and Whittaker at MMG Insurance. "I was very pleased with the additional educators who attended," said Dorsey. "Clearly, we need education to be more participatory and need more programs like those in Fort Kent High School that mandates job shadowing and senior projects in order to graduate." 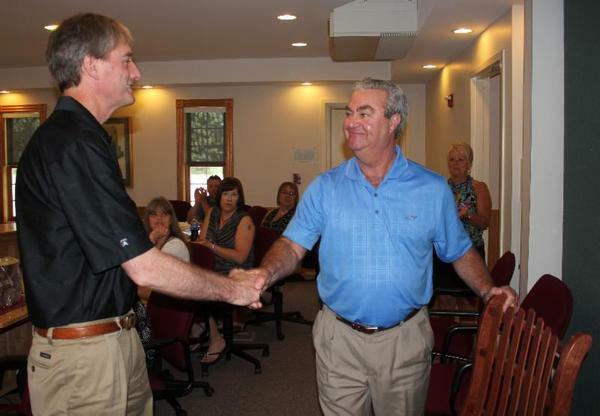 Ken Murchison, left, receives a congratulatory handshake and an Amish wooden rocker from NMDC Executive Director Bob Clark. Murchison was recognized for 30-years of service to the organization. Murchison was one of seven employees recognized at a recent luncheon. Also reaching milestones were Mike Eisensmith (10 years); Julie Corey, Jay Kamm and Alain Ouellette (20 years); and Rod Thompson and Ruby Bradbury (30 years).